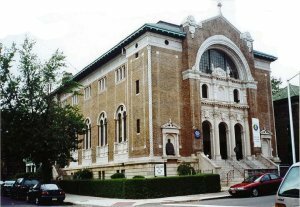 The Blessed Sacrament Roman Catholic Church was founded in 1902. The home of Frank J. Finley, 34 Homestead Park, held services for six months after April 1902. The cornerstone of a frame church was laid on September 27, 1903 with the dedication on November 26, 1903. A newer church was built for a cost of $130,000 in 1913. Includes individual indexes to baptisms and marriages. Marriage index is to groom only.